ONE STEP CLOSER. We might just get that Moon base Elon Musk is hoping for. 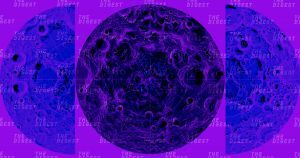 On Monday, researchers from NASA, the University of Hawaii, and Brown University confirmed the existence of water ice on the surface of the Moon at its poles. That could provide future lunar colonists with the easily-accessible water supply they’d need to survive off-world. The researchers published their findings in the journal Proceedings of the National Academy of Sciences (PNAS). A DECADE IN THE MAKING. For their study, the researchers relied on data from NASA’s Moon Mineralogy Mapper (M3), an instrument that journeyed to the Moon in 2008 aboard India’s Chandrayaan-1 craft. The instrument mapped the entire Moon’s surface to reveal its mineral composition. In 2009, that data helped scientists discover that the Moon had water molecules in its polar regions. They just didn’t know whether it was at the surface. From this same data, the team behind this new study confirmed that both of the Moon’s poles have patchy deposits of ice on their surfaces. The deposits at the southern pole are mostly contained within lunar craters; those at the northern pole are more spread out. ONWARD AND UPWARD. While we’ve known for nearly a decade that there’s water on the Moon in some form, this new study is the first to confirm that some of that water is in the form of ice, and that it’s on the Moon’s surface. This surface ice would be easier to access than ice below the surface, which could make it invaluable to our plans to return crewed mission to the Moon and perhaps even set up a lunar colony. For now, NASA and its partners plan figure out everything they can about this ice, including how it formed and its role within the lunar environment. And who knows — it could play a major role as we decide to send humans back to the Moon.